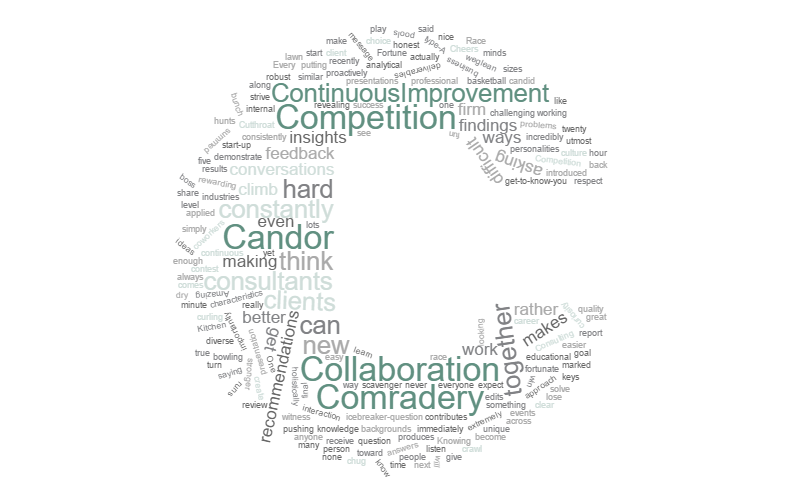 Candor. We’re incredibly honest with each other and our clients. One of our consultants summed it up when she recently said she’d rather work where people are candid rather than where everyone is simply nice. And a client once introduced us to his new boss by saying we’re “in the business of having difficult conversations.” We constantly question our approach, findings, and recommendations, asking “Is there a better way?” We review each other’s deliverables and expect to get them back marked up with lots of edits. We do dry runs of twenty minute presentations and then get an hour of feedback. Most importantly, we do all this with the utmost respect. It’s never about putting anyone down — it’s about constantly pushing all of us up. Continuous improvement. We’re constantly looking for new ideas and ways to solve problems. We strive to consistently demonstrate curiosity, listen, learn, and think holistically and proactively share our knowledge and insights with each other and our clients. Through our work with clients of all sizes from start-up to Fortune 50 and across many industries, we glean insights that can be applied in new and unique ways. Collaboration. We know we are stronger when we work together. We have very diverse educational and professional backgrounds, but very similar analytical minds. This makes for some really robust conversations and revealing get-to-know-you icebreaker-question answers. This level of interaction produces results none of us could on our own. Competition. We have a bunch of type-A personalities. When something can turn into a contest or a race, it will. While this is easy to witness during our internal events (scavenger hunts, Amazing Race, Cutthroat Kitchen, curling, lawn bowling, basketball pools …), I think this contributes to the quality of our work too. We see one of our coworkers create a great findings and recommendations report or final presentation and immediately start asking how we can do it even better next time. It’s not about making the other person lose — it’s about making all of us win. Comradery. We actually like each other (it’s true). We work hard and play hard together and have fun doing it. Knowing we’re all in this together and working toward the same goal makes it easier to work hard and to give and receive feedback, even when the work itself or the message is difficult. Every firm has its own culture and keys to success, but it always comes down to the consultants themselves. They make the firm climb, chug along, or crawl. Here’s to a continuous climb. Cheers! 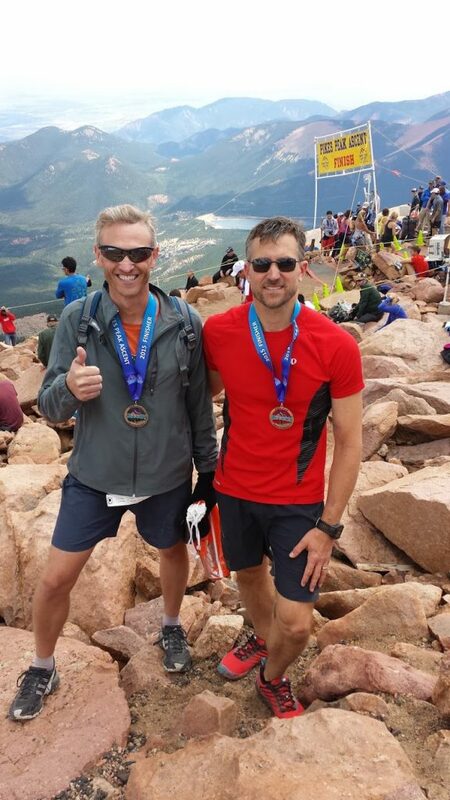 Last year, my friend Bill proposed we run the Pikes Peak Ascent, a half marathon up, you guessed it, Pikes Peak. The race description itself was daunting: Elevation gain of 7,815′, starting at 6,300′ and finishing at 14,115’ with an average grade of 11%; the trail is narrow and winding with gravel, rocks and dirt and includes sharp turns and abrupt changes in elevation and direction. After a few seconds of consideration, I said I was in. We’ve both run marathons (Bill many more than me) along with 50k and 50 mile ultras, so we have some experience, but we knew this was going to be completely different, especially since we live at 900’ in Minnesota. 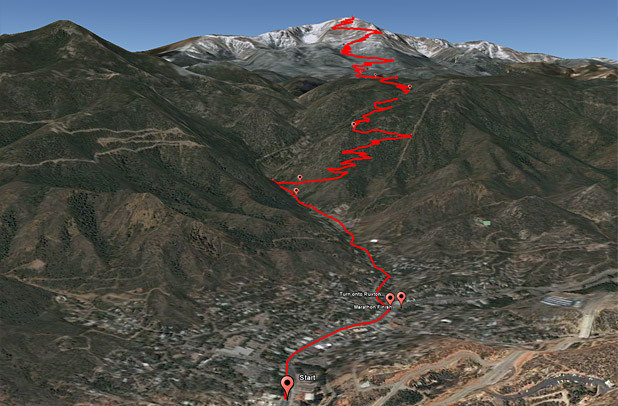 Google Earth view of the Ascent and Marathon course. We did as much as we could to prepare (Bill much more than me), but really went into it pretty blind. We both made it to the top (Bill far ahead of me) and as we con gratulated each other on the achievement I was tremendously thankful to have such a good friend, pardon the pun, push me to such new heights. Once my endorphins settled down and I had time to reflect, it was clear something truly special had just happened. I concluded the reason this was such a big deal was because it was a completely new experience and it’s been quite a while since I’ve done something this new. Running at altitude, the 11% grade, the terrain, the smell of the Bristlecone Pine trees — it was all different than anything I’d come across in the past. And it was exhilarating. Obviously it’s not realistic to experience something this dramatic throughout the year, but I do think it’s important to consistently encounter and tackle new challenges. 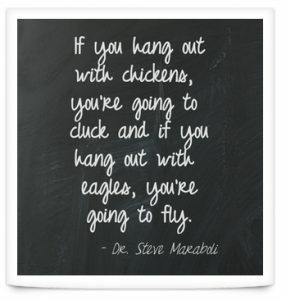 The opportunity to do this is what draws many of us to consulting, especially the work we do at Evantage. New problems force us to come up with new solutions. A canned or cookie-cutter approach won’t be enough. We have to explore new ways of thinking and constantly ask if there is a better way. New environments sometimes put us in uncomfortable situations. New relationships cause us to look at ourselves. What can I learn from this person? Does she possess qualities I admire and can try to emulate? Does he possess qualities I dislike and want to avoid myself? Once we’ve solved the puzzle and know we’ve delivered exactly what our client needs, we’re ready to continue on to the next challenge — often for the same client. New keeps us on our toes. We’re never sure what’s around the corner, but we know we can handle it. 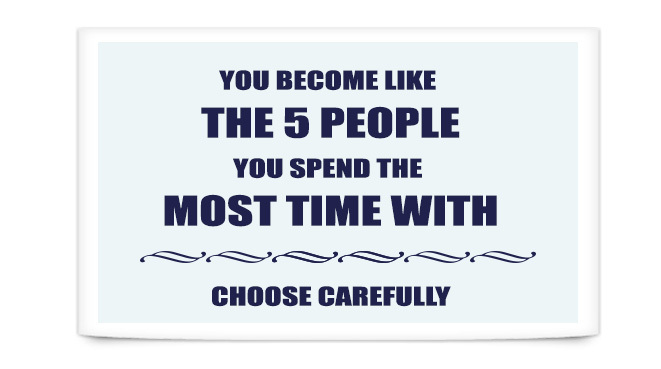 Much has been written about how your friends influence you and how you become the people with whom you choose to associate. It’s easy to find great quotes about this and I believe them wholeheartedly. I also believe they apply to your work colleagues, especially when they’re also your friends. 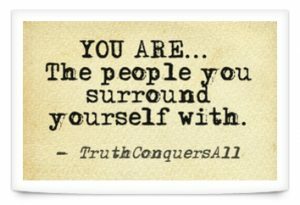 Choosing to surround yourself with people who can teach you more than you can teach them simply makes you better at whatever you do. I consistently find myself in meetings and presentations, whether they’re with clients or internal, where my colleagues are speaking and I’m thinking, “Man, this is so impressive.” I don’t mean they just had a great one-liner or a pretty slide. I mean the quality and depth of thinking, the detailed analysis, findings and recommendations, the command they have of the room, and yes, sometimes the pretty slides — it’s all truly impressive. It makes us excited to come to work. We’re constantly looking for new ideas and ways to solve problems and we want to see what our coworkers come up with. It might be a completely new approach to a project or a new way to organize and present the data, but they continue to push for the best way to do it. We’ve been doing this kind of work for a long time and it’s fun to still see something new so often. It makes us trust everyone we work with. We know they’ll do great work every time. We can collaborate on the big picture and then know everyone is focused on the details until they come together into a clear, cohesive deliverable. This level of trust allows us to be incredibly honest each other. When we review each other’s work and get it back marked up with lots of edits, we know it’s about high-quality service delivery, not about putting each other down. It makes us want to continuously improve. With all this great work going on, everyone is raising the bar and we want to keep up. We see one of our coworkers create a great findings and recommendations report or final presentation and immediately start asking how we can do it even better next time. I’m not excited to come to work. I don’t trust my coworkers. I have no incentive to improve. It’s easy to see which scenario provides a better overall experience for employees and clients. I can’t wait to be impressed again tomorrow. 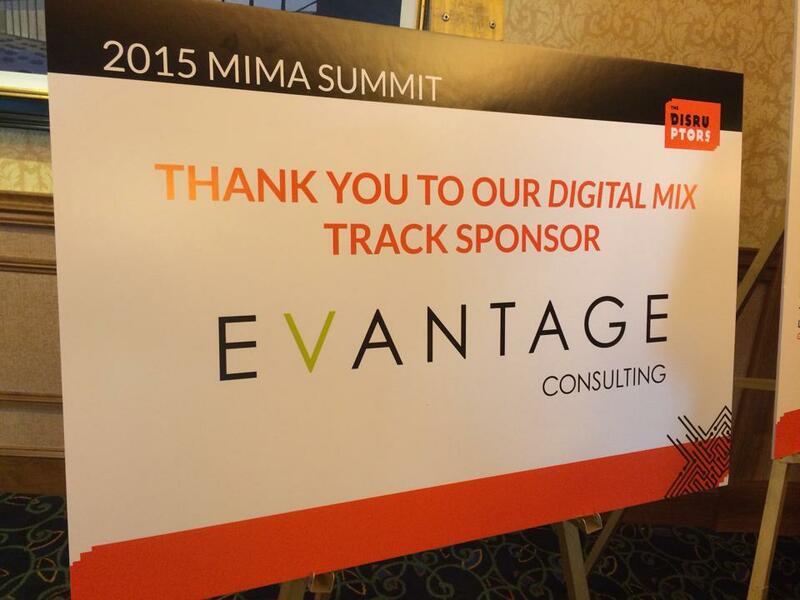 The 14th annual Minnesota Interactive Marketing Association Summit was held this week. This well planned, well executed, and sold out event featured an impressive lineup of speakers and keynotes that moved the mind and the heart. Evantage has a long history with MIMA and the Summit. Our founder, Robin Carpenter, helped found MIMA in 1998 and served on the board until 2002. I met Robin at a MIMA event in 2000 and quickly joined her committee before joining the board in 2001. I helped create the first Summit, and eventually served as MIMA President. 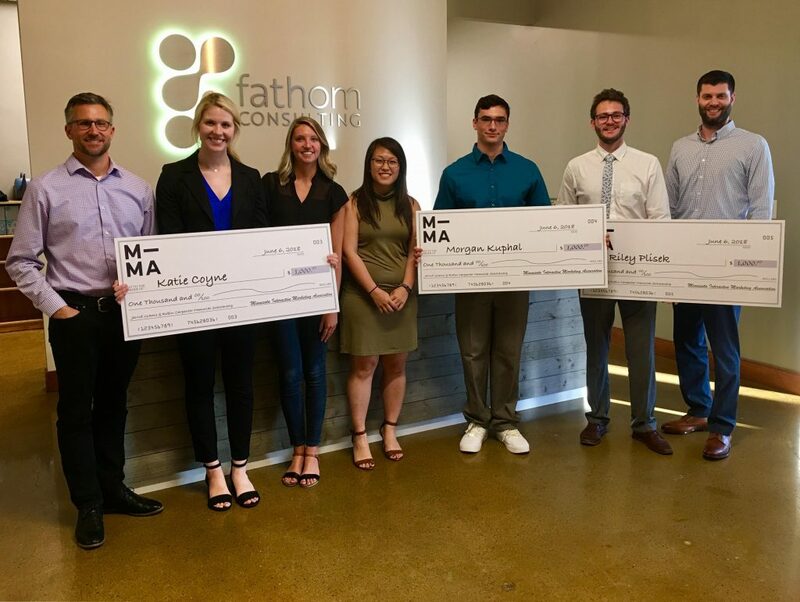 Our Managing Partner, Kate McRoberts, served on the MIMA board for 4+ years, helping program events and the Summit during a time of exponential growth for MIMA. MIMA was founded by a small group of people who knew that sharing their knowledge was the best way to help each other figure out how to do their jobs better. 17 years later, the association is a nationally-recognized leader and is fulfilling its mission to raise the level of talent in Minnesota, challenge the status quo and inspire innovation. We’re proud to be a part of it. Congratulations to the current MIMA Board on a job well done.